To mark 60 years of Her Majesty The Queen as Head of State in the United Kingdom Stitching Cards have released a free Diamond Jubilee pattern. The Diamond Jubilee celebrations will centre around an extended weekend in 2012 on 2, 3, 4 and 5 June. Queen Elizabeth II came to the throne on 6 February 1952 and her coronation took place on 2 June 1953. She celebrated her Silver Jubilee (25 years) in 1977 and her Golden Jubilee (50 years) in 2002. The only other British monarch to celebrate a Diamond Jubilee was Queen Victoria in 1897. 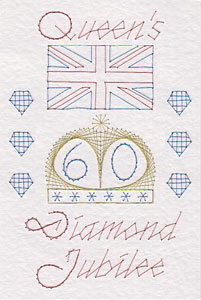 The Stitching cards Diamond Jubilee pattern would make a great souvenir of this royal occasion. You can download the pattern at stitchingcards.com. Thank you so much for designing this for the jubilee, I have stitched this on an artists small canvas and it will be displayed in the town church for our celebrations, and then kept in the local museum. Thank you for your comment Janet. I wish you all the best for your church display.